While most ski enthusiasts will probably know Austria’s largest skiing area, Ski Arlberg, and the village of St. Anton, less will know nearby Lech and Zürs which are also part of the Ski Arlberg area. Both villages, but more true for Lech, have a status as the fashionable pendants to St. Anton. The two small villages can boast of an impressive number of exclusive accommodations – 11 five-star hotels and 72 four-star hotels! Another easy way of determining the prominent lifestyle here, is to glance at the expensive cars parked at the sides or passing through the main street. This is not just a place to ski, but also, for many, a place to be seen or enjoy a lavish holiday. However, there is no reason to write of a stay in Lech or Zürs just because you don’t drive a Range Rover or a Mercedes G-class. This is also a nice retreat for people looking for just a more mature and stylish experience, and you will be able to find affordable accommodations, while maintaining that feeling of being in a posh, evocative area. The atmosphere is relaxed, and you will blend in whether you turn up for after-ski in your ski boots or in high heels. This is basically just a really nice place to be, and the centre village oozes charm and high spirits. Village life aside, most people are still here to ski and you have the entire 300 kilometres of Ski Arlberg open to you. If you prefer to get on the slopes before others, consider some of the ski in/out accommodations in Oberlech which is situated in higher altitude and offers direct access to the slopes. Mind though, that the entire Arlberg area has a backlog of old 2-chair lifts that should have been retired and renewed long ago – and if you stay in the far right side of Lech and Oberlech you will have to take one of those up (Schlosskopf). The final decent is narrow, icy and challenging for beginners and even intermediates, and like with all other old two-seater chairs that runs at the same speed whether over terrain or when loading people, it will hit you hard in your calf and then swing you out over a small river and make you feel that you were just about to be thrown off. I suspect this never actually happens, but either way, it is below standard for a modern area to keep such lifts running still (check out our St. Anton am Arlberg review as well). 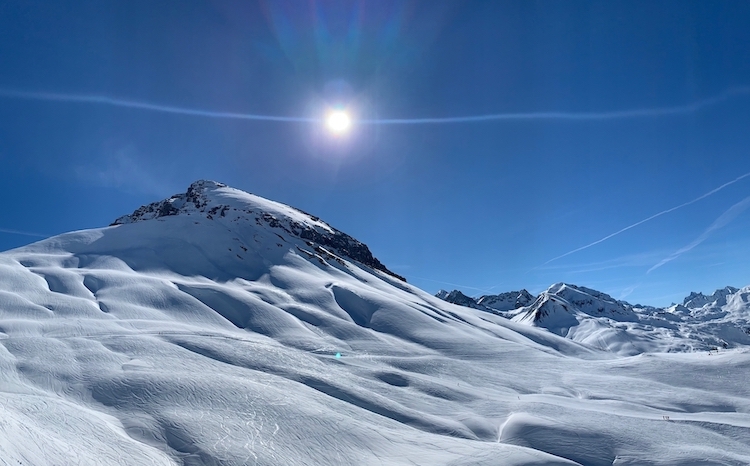 While the slopes just above Lech and around Oberlech, are very family- and beginner-friendly with lots of blue slopes, those looking for further challenges can easily create some day-long journeys with a variety of runs. Consider going up with the Rüfikopf gondola – this will take you to a remote peak where you can choose between an easy blue decent or some ski routes. The ski routes are very doable for intermediate runners, and you will be rewarded with fantastic, uninterrupted scenery. Through different options, you will pass by the lovely Hexenboden with several wonderful runs, and it will eventually take you to the cosy village of Zürs. From here you can either go towards St. Anton by the newly build Trittkopf and Flexenbahn, or you can hit over to the other side of Zürs and continue to Zug. The trip to Zug will require ski-route skills, but again, for most intermediate skiers this will be easily doable, and you will see amazing parts of the area and far less people than in the more crowded mid-areas. Once done inhaling this amazing backyard of Zürs, you can go up to the higher areas behind Lech (once again you will find yourself in a historic two-seater chair… ) and your circle is almost completed towards Lech. However, besides the wonderful red runs and ski routes at the Zuger peak, from here you can go all the way over to the remote areas of Warth. There is a wonderful modern gondola called Auenfeldjet that will impress everyone with a little technical interest. It combines a chairlift and a gondola so that every other carrier is a chair taking you back to the Lech area and the others are gondolas taking you to the Warth and Schröcken area. On your way to Warth you will be running down a number of very nice slopes and you will again experience far less people than on the main “roads”. For experienced skiers there are quite a few fantastic black slopes out here. 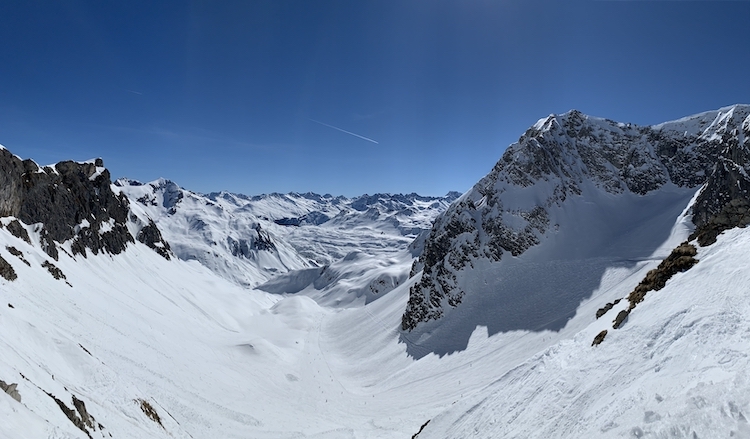 Overall, the Lech Zürs area is a very nice alternative to staying in St. Anton. You have the same amazing ski area with some of the same qualities as in St. Anton – lots of off-piste opportunities, nice ski routes, beginner areas and – in addition, a posh village life that will make you smile and feel a little distinguished.